This puzzling mini-game is all about using logic to assign 4 gifts to 4 elves. The elves will give you logical propositions, allowing you to deduce what configuration will give each elf a valid gift. However, their statements are completely random, allowing for basic requests and much more complex ones. For your information, some statements will require you to check the colour of the day, shown by an indicator in the map. There are 3 Modes: Normal, Mental and Endless. In each, you will have to solve as many days as possible as quickly as you can. The exact details vary, as you will see in-game. For beginners, Normal mode is the best choice since it is a progression from basic statements to the complex ones. Every set of statements that appears has been randomised, but there will always be at least one valid solution with the presents that are available on each day. This map can be played singleplayer or multiplayer. There is no limit to the number of players, but I expect that it may become too chaotic if there are more than 4 players. 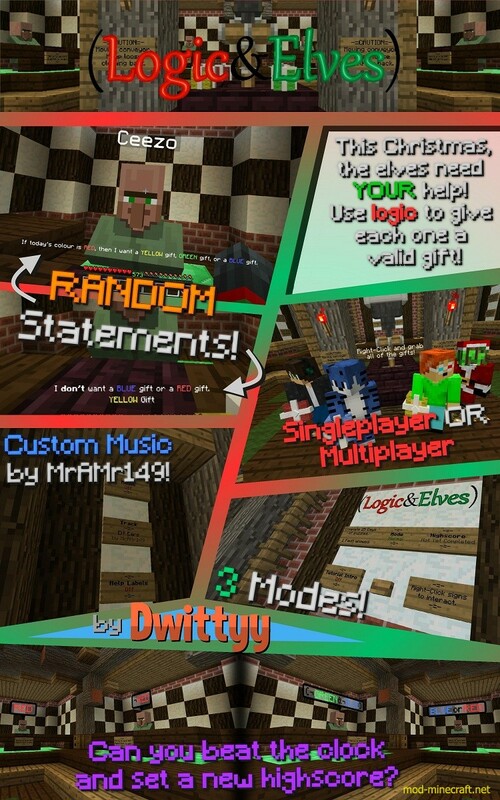 There is a resource pack included with the map. If you’re playing on a server, then all players may need to download the resource pack and enable it.